The CV & Interview Advisors are the UK’s leading providers of Personal Branding services for Contractors, Interim Managers and Freelancers. These services are designed for mid-level to senior professionals and we have negotiated a 15% discount for ‘Contractor Weekly’ members. Predicated on marketing principles, the psychology of reading documents, deep knowledge of the recruitment industry and many years of research, The CV & Interview Advisors have developed a number of leading-edge CV frameworks that significantly improve interview and job offer rates. Their Professional Level service is based around a detailed 2 hour fact finding session to explore all that is great and good about you. One of their senior-level Personal Branding Specialists will then create a high-impact CV based upon this information and will be happy to keep working on your new CV until you are 100% happy. LinkedIn has over 460 million members worldwide, it has become the pond that recruiters fish for talent and most hiring managers will check out your LinkedIn profile before they interview you. In addition, a high percentage of your business contacts will view your LinkedIn profile before meeting with or talking to you, so it is critical that you have a good LinkedIn profile. Similar to the CV writing service, you will have a detailed fact-finding session to explore all that is great and good about you. One of The CV & Interview Advisors’ Personal Branding Specialists will then create a high-impact LinkedIn profile based upon this information and will be happy to keep working on it until you are 100% happy. It is important that your CV and LinkedIn profile dovetail together and buying both services together represents incredibly good value for money, therefore we have negotiated a significant discount on a combined CV and LinkedIn package. Being good at anything requires coaching and practice. Relate this to interviews and The CV & Interview Advisors provide a one-to-one interview coaching session followed by the opportunity to practice your interview technique through a mock interview. The questions are tailored around your profession and target roles and the mock interview is conducted and recorded using advanced virtual interviewing technology (which you access from the comfort of your own home or office). 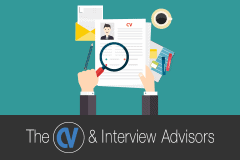 One of The CV & Interview Advisors team then analyses the recording of your interview and provides verbal feedback on your performance with detailed advice on how you can improve.